Owing to the immense experience in this domain, we are providing an excellent range of Georgette Printed Suit that is an ideal party wear. In tune with the recent fashion trends, our offered suit is beautifully designed under the adept guidance of our highly creative designers using super fine quality fabric. To ensure a flawless delivery from our end, this suit is dispatched after proper quality checks on different parameters of quality. 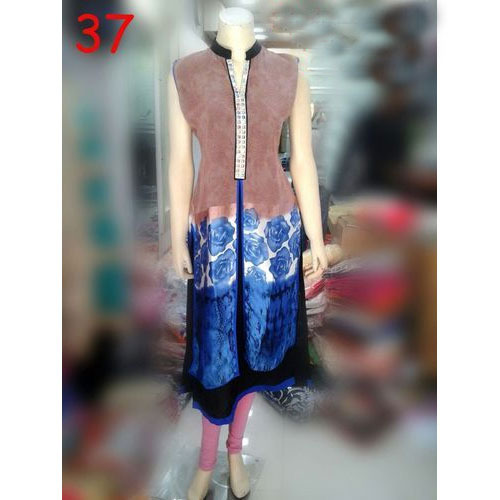 We “Shiva Dyechem” are involved in manufacturing and supplying an alluring collection of Ladies Suits, Designer Suits, Designer Kurti and Ladies Leggings. Established in the year 2010 at Ludhiana (Punjab, India), we are a Sole Proprietorship company committed towards offering an attractive range of garments. In order to provide our clients with the current fashion and styles, this range is designed according to the ongoing fashion trends. Furthermore, this range is designed using quality assured fabric and latest techniques at our cutting-edge designing unit. Owing to its remarkable features like eye-catchy look, skin-friendliness, perfect finish, alluring color combination, attractive embroidery and longevity, this range is widely accredited by our valued patrons. Our professionals ensure to meet the variegated clients’ demands by offering this collection in a plethora of colors, designs and other specifications as per the diverse choices of the clients. To maintain excellent quality standards and to deliver an impeccable range to our valuable clients, our quality check team thoroughly checks the offered range against set quality standards before dispatch. Our expert professionals work in a close coordination in order to serve the large-scale market demands. Besides, we offer this alluring collection at pocket-friendly costs. We are offering all our products under the brand name Eagle Fashion.